Art makes your room come alive. 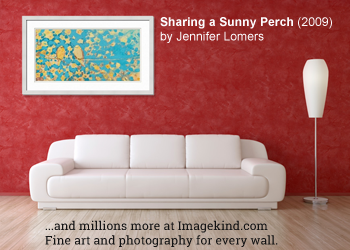 When your art brings you joy it will brighten the room every time you step into it. We want you to think of your space like a visual symphony. If your art and decor work together in counterpoint, you can fine tune the tone. Whether you are looking for bold or complex, muted or layered, your artwork and furnishings can work independently but in harmony for the look you want. Creating this balance can mystify most people looking to decorate their own space. If you aren't going to galleries on the weekend you are probably browsing images online hoping the right art will pop out at you. Do you simply hang that piece you fell in love with even though it doesn't fit the room just right? Or do you try to find something that harmonizes with the décor in some way. The answer is different for everyone, but we're going to help you make whatever method you use look good. One note regarding terminology. There are those who say prints, giclees, or other reproductions are not 'art' but merely decoration. There is definitely more inherent value in original artwork, and we don't condone the exploitation of an artists' hard work. However, high quality original artwork is cost prohibitive for many, and modern technology is making it easier for artists to reap at least some financial benefit by using profit sharing printing platforms. For simplicity, we will be using the term “art” to mean either original or reproduced works and leave that debate to others. With that out of the way, on with our list of ways to make your art work with your decor. 1. Don't match the art to anything. Yes, this seems to contradict our title, but bear with us. Art is diverse and personal. Therefore, many designers and decorators advise to find something that speaks to you. Be it the style, colors or topic of a piece, if you love it and can afford it, go for it. "But", you say, "the piece does not go with my room at all." Well, there are some options to make such a piece feel like it belongs in the room. For example, look for a frame and/or matting that matches another piece in the décor. Just be careful that it does not clash with the colors in the artwork. Or don't try to match anything at all. If you love the art, you make it part of the room. Note the unique frame behind the couch. Another frame matches a furniture piece. See how the frames 'go' with different pieces of furniture. Great tie-in of the gilded (gold) frames with the pillows. "If you love the art, you make it part of the room." We pause with the list here as the rest of these options require matching color in the artwork with the décor. Historically, decorators would wander through their favorite haunts for art lugging along paint chips, fabric swatches, maybe even a curtain or lamp shade. Then they would dutifully compare said items with the artwork while browsing. We humbly submit the color search option at Art By Hue as a much easier alternative. More on that later. Now back to the list. Along with the first option, this is what we often see in all the magazines and awesome Instagram accounts we love to gawk over. The ideas is simple, tie in accent colors from the room with the art. In practice this can be a challenge, but the results are often spectacular. The red pops in both the artwork and rug here. Great use of color here with the pink and green. Another splash of bright color in the artwork and the pillows. The matching color could be in a number of items, or even just one piece in the room. The item(s) could be close to the painting or not, as long as they are positioned such that both are seen simultaneously by the viewer. The color must be a very close match for the eye to pick up on the cohesion between the art and the décor. What if you are trying to match something large, like a rug or chair fabric that you don't have a swatch of? You might be tempted to take a picture with your phone and use that to compare to the art when you find it. Don't do it! The colors from the phone camera and screen are not to be trusted. A better alternative is to visit your local paint supplier, and pick up all the paint chips you think are close to the color you want to match. Usually you can find a shade very close to the desired chair or rug or whatever. Now you have an accurate color sample to compare when you're at the gallery or store looking at art. "The color must be a very close match for the eye to pick up on the cohesion between the art and the décor." We digress once more to mention this is why we have preset paint colors to search with on Art By Hue. This gives the best potential that the art you order online will indeed match the color you are looking for. The preset colors come straight from the paint manufacturers, so they are the closest representation we can get to the actual color. When using a non-neutral paint color, such as on an accent wall, finding art containing a little of the same color can be a great look. The brown from the wall is not dominant in the painting, but it is there. Very nice deep blue accent wall where the art ties everything together. The challenge here is accurately identifying the color. Our eyes are naturally drawn to the dominant colors in a piece, so a conscious effort is needed to identify that an accent color is indeed part of an artwork. 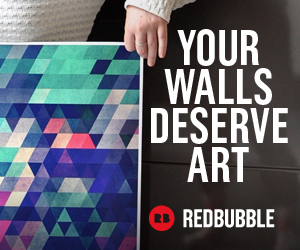 Unless, of course, you use Art By Hue. 4. Find art where the wall color is dominant. The blue in the prints match the wall. The big mats make it work. The frames give enough distinction to the artwork that we are not bored by the same colors. Dramatic art use with black negative space around the blue that matches the wall. Nice, right? The trick is to have plenty of 'negative space' around or even within the artwork. This can be done with large plain mats to separate the art from the wall. "Have plenty of 'negative space' around or even within the artwork"
The opportunities to have art that compliments your decor are seemingly limitless. The right artwork can add life to the most drab of rooms when properly chosen and utilized. These methods will truely make the art part of the room, not just filling wall space.